Noteworthy special guests Plus Free Proctors Ghost Tour Schenectady, N.Y. - On August 25th the Proctors Volunteer Tour Guides will present a fundraising Psychic Fair from 10 a.m. to 4 p.m.at Proctors Theatre. For believers and non-believers alike, it&apos;s time to gather friends for a fun, informative and intense psychic experience and day at the Capital Region&apos;s premiere arts and entertainment complex. Tickets are $10. The wondrous Psychic Fair at Proctors is calibrated to thrill and chill participants to the bone with otherworldly experiences, says organizer June Grinter, coordinator of events for the day. 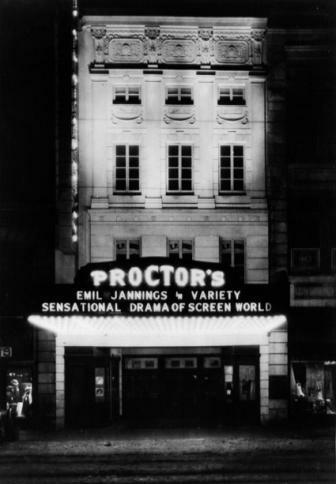 "It is only natural that the event should take place at Proctors." She notes that since opening in 1926, mysterious disappearances, ghostly mists, and restless spirits have accumulated as Proctors backstage lore. According to Grinter, "for the second year, Proctors will be sharing these thrilling experiences with the public with a free Ghost Tour, presented by the knowledgeable and enthusiastic Tour Guides of Proctors. The esteemed Marilyn Sassi, a local expert on the history of Proctors, is director for the Tour Guides at Proctors. Noted mentalist, Michael Anthony Russo, has amassed an amazing lineup of speakers and vendors for our Psychic Fair. FREE, GUIDED GHOST TOUR Running concurrently with the August 25 Psychic Fair, Proctors Ghost Tour takes participants on a spine-tingling journey through places in the theatre that few dare to go. Explore creaky backstage hallways, haunted dressing rooms and eerie basements while hearing firsthand accounts and tales of ghostly hauntings. Brave enough to venture into the unknown at Proctors? The Ghost Tour is free and open to the public. Running time for Ghost Tour is 45 minutes of information and fun! Ticket Price: FREE with reservation. Space is limited. Reserve now by completing the ONLINE RESERVATION FORM or for more information contact June Grinter at june.grinter@gmail.com. Special Guests, Vendors Share Expertise in Supernatural The August 25 adventurous double-bill includes special guests and vendors from the realm of psychic exploration. Several noted psychic readers will share their expertise and supernatural encounters, making this event a uniquely fascinating and fun experience for everyone. Among the noted special guests will be Ann Fisher, a world renowned psychic, hypnotist and ghost hunter who has traveled the globe in search of ghosts. Her spellbinding presentation includes a deeper, eye-opening look into the world of the supernatural and the opportunity to witness even more about her psychic abilities. Ann&apos;s presentation will take place in the Fenimore Gallery at 2PM. Participants are urged to register early. Direct from Las Vegas, is Cory Haines, who will perform at 1PM and 3PM. He will delve into the realm of gypsy rituals, ghostly encounters and other mysteries. Cory will guide participants through an old gypsy curse that opens a portal between the mortal and immortal worlds. He challenges those who dare to enter "the center", and relive the Golden Age of the early-1900s spiritualist movement in this theatrical séance experience. Noted mentalist, Michael Anthony Russo, will present, "The Joy of Palm Reading" at noon - a humorous interactive palm reading lecture where Michael teaches participants to read their own hand. Will your hand tell you something about yourself that you don&apos;t even know? Participants will learn that they have the power within to do it themselves! Who knew?! Swami Sadashiva Tirtha (Author/Shaman/Energy Healer) will present a program at 10 am on Spiritual Science: Realizing the Eagle-Condor Prophecy in 2012. As the Amazon Rainforest Shaman report, this is the beginning of the Eagle-Condor Prophecy (spirituality & science fly side by side). This workshop blends psychic healing with cutting edge technology of cold Lasers, EEG, Heart & brain waves. Marilou Trask-Curtain (Published Author) will present: "Heavenly Communications and Near Death Experiences." The topic of Marilou&apos;s speech will be her personal contact with the dead (both form and dream visits with the departed since her first near death experience at age three.) She will be selling copies of her recently released book (Llewellyn Worldwide Publications, Inc) "Dreaming of the Dead: Personal Stories of Comfort and Hope" and would love to visit with people at her booth about their own experiences and answer any questions they may have. These are just a few of the fun events awaiting those who dare to undertake this otherworldly end-of-summer experience. Participants will want to linger long and refresh on an abundance of delicious delights for purchase to provide energy for their intense spiritual encounters. Below is a timetable of speakers and topics.